By Jennifer Burcke on September 6, 2011 Visit Jennifer's Website. I’d like to tell you that I had spent the days since my last post announcing 1840 Farm’s participation in the Purina 60 Day See the Difference Challenge enjoying a little rest and relaxation. I’d like to, but it would be far from true. Instead, I spent the time trying to prepare for and recover from Hurricane Irene. Funny, I don’t remember inviting her to my weeklong vacation. This was the first major storm that we had prepared for since becoming chicken keepers. Suddenly, we had a whole new list of items to add to our ever-burgeoning emergency supplies. During the days leading up to Irene’s arrival, we were forced to drive to several local feed stores to stock up on feed for our chickens, goats and rabbit. Apparently we were not the only farmers attempting to do so before the storm arrived. The first stop yielded a 50-pound bag of Layena Sunfresh pellets. Unfortunately, the store was completely sold out of the feed for both our goats and rabbit. The employee at the second stop apologized for having so little to offer us due to the influx of people stopping in to stock up on feed for their animals. Luckily, the third stop was the charm for both the goats and rabbit. Finally, all of the animal feed was taken care of. 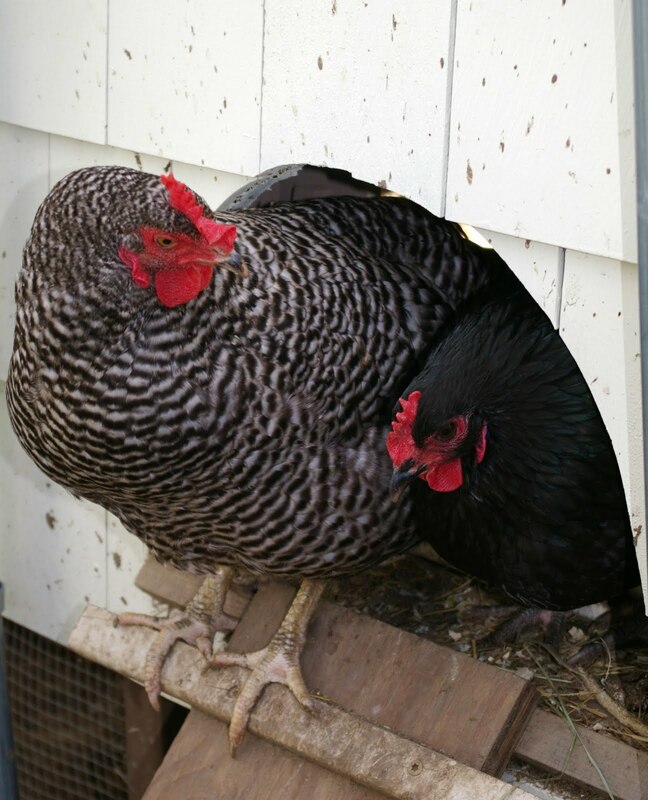 Now that bags of feed and bales of hay were resting safely in the barn we were left to tackle the bigger issue: Would the chickens be safe in their coop or did we need to move them to another temporary location? 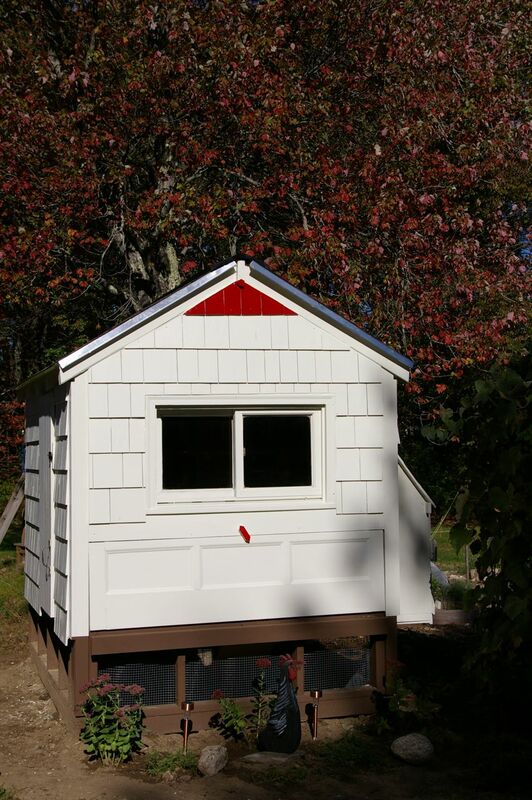 Our coop is only a year old and, having built it from the ground up, we knew that it was sturdy and structurally sound. What we didn’t know was how it would fare in the 70-mile-an-hour winds that meteorologists kept warning us about. For the last few days before Irene’s impending arrival, we discussed our options. The first, and easiest, was to keep the chickens inside their coop during the day of the storm and let them ride it out just like we would from within the farmhouse. The second option was to move them inside the main aisle of our circa-1840 barn, using the pen they had spent their adolescence in while we finalized their coop. The pen is 6 feet wide and 10 feet long and covered both on the four sides and top of the enclosure. While it wouldn’t feel like home to them, we knew that they would have enough space to stretch their legs and move around. The final option was to relocate the hens to the stall occupied by our two Nigerian Dwarf dairy goats until the storm passed. Leaving our heritage breed hens in the coop was truly the easiest option, but we were concerned that the coop might not be able to survive hurricane-force winds. Moving our flock inside the barn would alleviate that fear, but brought with it another. Would moving our seven hens to a completely new location bring additional stress to an already stressful situation? Unfortunately, there was no way for us to know. Moving the hens in with the goats temporarily seemed like the least attractive of our options. 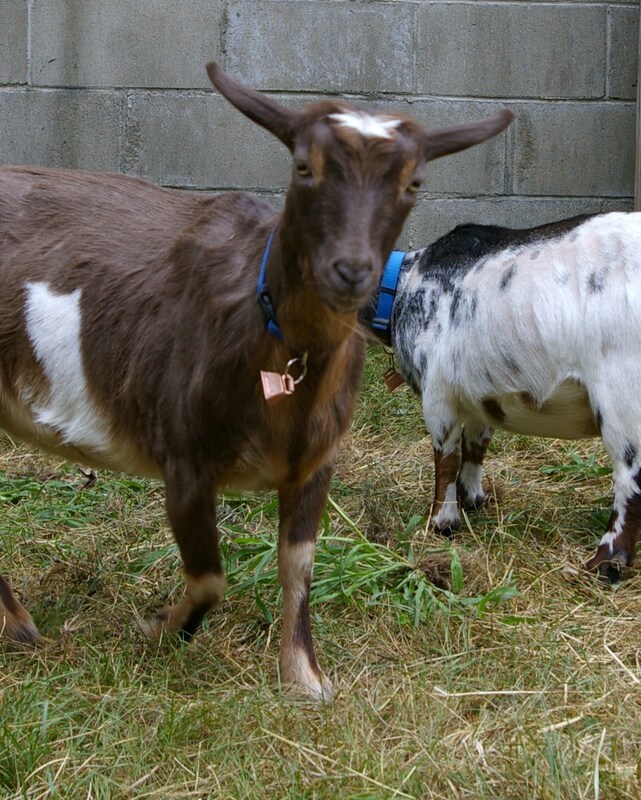 The youngest of our goats, Violet, is pregnant with her first kids and should deliver during the middle of October. If we suddenly turned her quiet stall into the 1840 Farm version of Noah’s Ark, we ran the risk of having seven stressed-out hens along with one very unhappy, very pregnant goat. We knew that our other goat, Tassie, would adapt. In fact, I could picture her making friends with the chickens and being sad to see them return to their home after the storm had passed. I wasn’t at all worried about Tassie suffering from the stress of the situation. She never does. 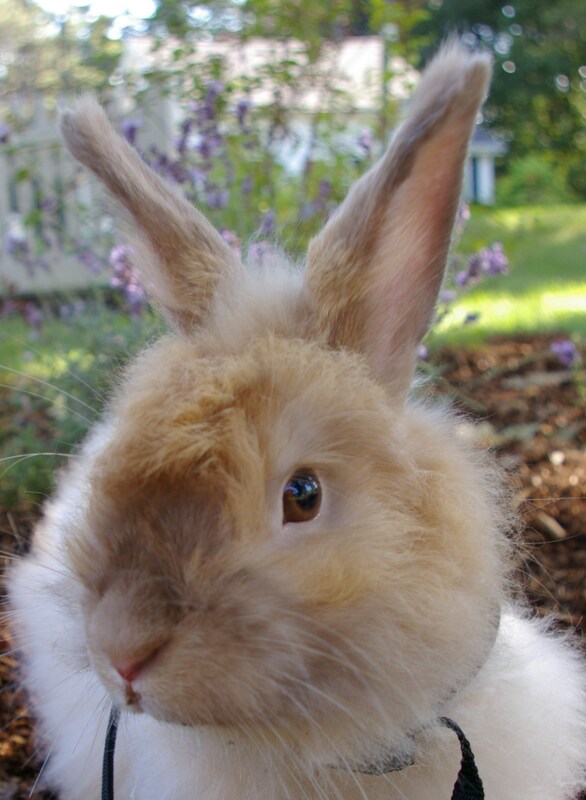 She has company in that club at our farm with our French Angora rabbit Herbert Menninger. Neither of them were the least bit curious about all of our storm preparations. In sharp contrast, Violet and the chickens seemed to be watching our every move and questioning why we were making them. In the end, we decided to leave well enough alone. The potential of upsetting eight of the 10 animals living at 1840 Farm and all of the egg layers was too great for us to discount. We reminded ourselves that we would be riding out Hurricane Irene from within a farmhouse built two decades before Abraham Lincoln became president of the United States. We shook our heads and wondered if we should move ourselves to the center aisle of the barn. With the preparations made, all we could do was wait for the storm to arrive. Well, that and stay up until 3:00 a.m. the night before canning all of the farm produce I could in case we lost power. It seemed doubly cruel that Irene would come calling during the time of year when our daily garden harvest is measured in pounds instead of ounces. 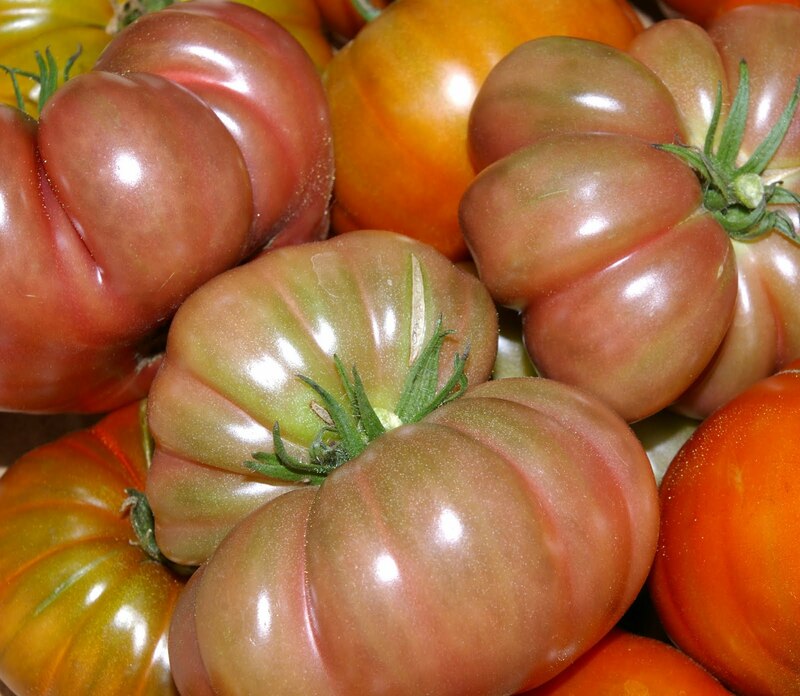 The canning pot keeps busy here during August and September, but without power, I’d be left to watch as our beloved heirloom tomatoes and fresh fruit sat on the counter and wasted away. Invitation or not, Irene came on Sunday morning. While she didn’t drop as much rain as had been forecast, she brought with her wind gusts that knocked out the electricity, telephone and Internet access to our farm. To say that they were knocked out might be a bit of an understatement. The electrical box was completely ripped from the side of our farmhouse. 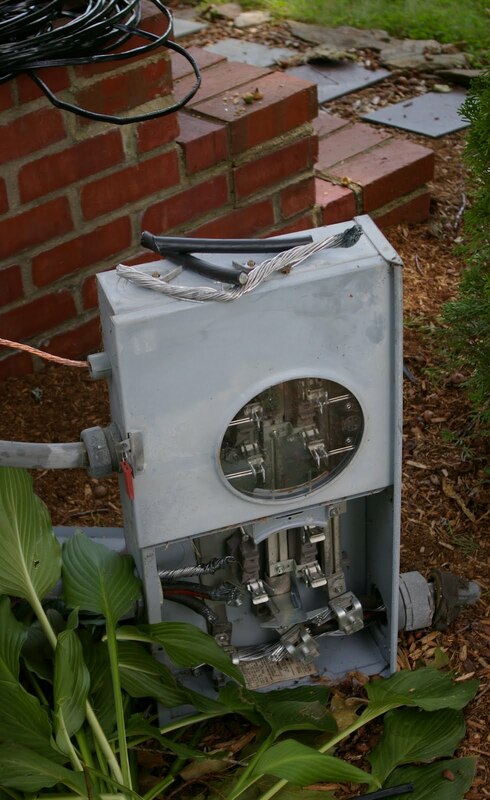 The box, meter and electrical cable snapped from the pole across the street and took up residence in our front yard. It was tough to be optimistic about power being restored in a timely fashion when we had been effectively removed from the power grid. Welcome to life in the year 1840 at 1840 Farm. We had planned to spend the week camping on a beautiful lake in our state’s park system. Instead, the trailer was moved to the driveway and the generator roared nonstop to power the refrigerator and morning coffee pot. Instead of looking out the window at an expanse of beautiful lake and forest, we looked at the chicken coop and marveled that it had made it through the storm unharmed. For a week, we listened to the roar of the generator and worried that its noise, along with the flurry of power company line crew trucks arriving in the middle of the night, would cause a drop in egg production. Instead, our girls treated us to a week with 29 fresh eggs. Given that we had a refrigerator the size of a cooler to share between the six human residents of 1840 Farm, we were thrilled to have them. Every night, we found ourselves armed with cast iron skillets warming over the barbecue grill. The sizzle of the butter and eggs cooking over the flame was comforting. With every bite of those freshly cooked eggs eaten as dusk enveloped our farm and flashlights became necessary, we marveled at the resilience of our flock. We were shocked that they were able to endure the sights and sounds of the past 10 days without missing a beat. I am happy to report that power was finally restored late Friday evening to 1840 Farm. We enjoyed the luxury of lights, television and Internet access over the weekend. While we didn’t end up spending the week as we had planned, we were safe and our farmhouse, barn, hoop house, and chicken coop were untouched by Irene’s wrath. We knew that farmers in neighboring Vermont were not as lucky. It’s too soon for me to discern the lessons I learned from Hurricane Irene. I don’t know yet if I learned something new or if she served to remind me of something I learned long ago: weather, like life, can be totally random. While my neighbors were left unscathed by the storm and had power restored in less than 24 hours, we were in the dark for six full days. People on farms in other parts of the country could be without their bearings for months, so I feel like my complaining has to be held to a minimum. Instead, I’ll pass along the newest piece of knowledge that I will have forever cemented in my brain thanks to Irene. Prepare for the worst storm possible for yourself and your farm. Respect each storm for the power that it holds. Run through your supplies and have the essentials on hand, hoping all the while that you will not need them. Finally, when you are making your emergency supply list and checking it twice, make one essential addition. Along with bottled water, canned food, flashlights and batteries, pencil in “flock of egg-laying chickens.” And, of course, don’t forget to stock up on chicken feed. Glad to hear you made it through I one piece. Question: why didn’t you have any oil lamps? Yes I know they’re a fire hazard but if you’re careful they do a fine job. From what I’ve learned the bigger the wick the more light you get. So pay attention to the size of the wick before you purchase any oil lamps. I used to live in a town of around 100 where the power would regularly go out during the summer monsoons and the winter blizzards. The rule of thumb was to have a minimum of 3 weeks supplies and you’ll be fine. Thanks to all of you for your well wishes. We were lucky to have made it through the storm safely without any damage to our animals, barn, coop, or hoophouse. Glad to hear you’re all well! I’m so glad to hear that your flock came through the storm safely and that you didn’t have any damage. 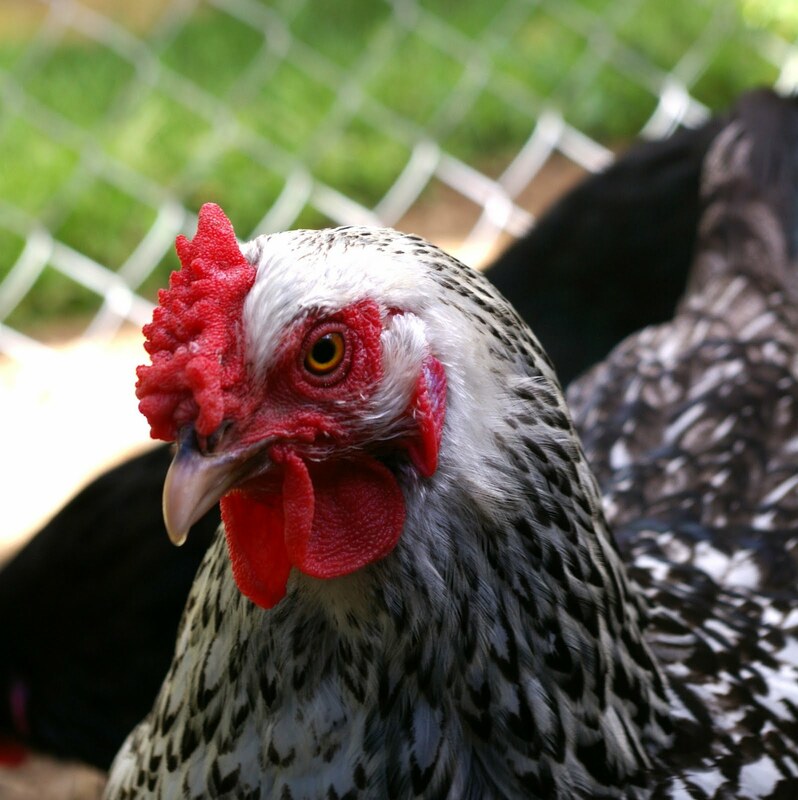 Keep reading and keep sharing your chicken keeping experience with the rest of us. I enjoy reading about all of your flocks just as much as you enjoy reading about mine!